"A country, after all, is not something you build as the pharaohs built the pyramids, and leave standing there to defy eternity. A country is something that is built every day out of certain basic shared values. And so it is in the hands of every Canadian to determine how well and wisely we shall build the country of the future." "Who speaks for Canada? Our strength lies in our national will to live and work together as a people. Weaken that will, that spirit of community, and you weaken Canada. Weaken Canada, and you damage all the parts, no matter how rich some of those parts may be. My friends, you and I must stand up for Canada, and we must see that there is a national government that has the courage to do so as well." "But this is not the end. He left politics in '84. But he came back for Meech. He came back for Charlottetown. and what we're all capable of." "What a magician this Mr. [Brian] Mulroney is, and what a sly fox! ... In a single master stroke, this clever negotiator has thus managed to approve the call for Special Status (Jean Lesage and Claude Ryan), the call for Two Nations (Robert Stanfield), the call for a Canadian Board of Directors made up of 11 first ministers (Allan Blakeney and Marcel Faribeault), and the call for a Community of Communities (Joe Clark). He has not quite succeeded in achieving sovereignty-association, but he has put Canada on the fast track for getting there." "But he won't be coming back any more. It's all up to us, all of us, now." It always surprises me, although after all these years it really shouldn't, when I hear some "eminent" authority re-interpret history according to his or her own agenda in disregard of the facts. If historians don't get it right, how can we expect the average person to understand what is really happening? 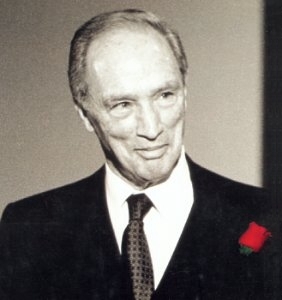 In the following few paragraphs (if I ever get around to them) I want to remind myself of what was really happening when Pierre Elliott Trudeau took some of those decisions that certain people who should, and do, know better like to denigrate.